How to use Clipboard in Docurated? : Quark Software Inc.
Once the necessary content has been added to the Clipboard, to open and work with the curated content, click on the "Clipboard" tab in the left panel of the window to expand it. To view the clipboard in full-screen or minimized mode, click on the "Expand" or "Minimized" icon (arrows). 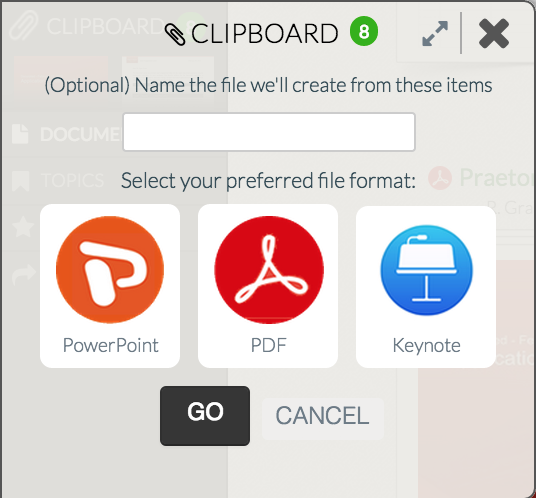 To export the curated content from the Clipboard, click the "Export" button, select the required format (Powerpoint (including Powerpoint templates), PDF, Keynote), type the name of the file and click "Go". To save the content as a document, click the "Save" button, create a new document by typing the name or select the existing document, and click "Save". Open in Presenter: enables to start an immediate live presentation. Send a Link: allows to send a link to view the content in Presenter. Create a File and Share: allows to create a document in Docurated and share it with other users. To empty the Clipboard, click the "Empty" button.